The new Girl Scouts Meeting House replaced the existing building at the same location in the Northwest section of the Cambier Park, adjacent to the new Arts Center. The new 2,000 s.f. Meeting House is designed to accommodate daily use by troops in a large Hall suitable for meetings, arts, & crafts, supplemented with an Office, Kitchen, and A/V Facilities. 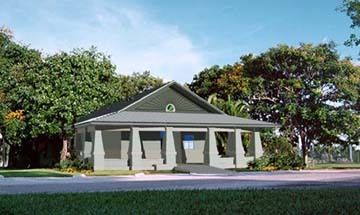 The design is based on eclectic Florida-style Architecture, with traditional elements such as deep roof overhangs, a metal roof, and a large front porch facing Park Street. The elevations are designed to quietly blend into the context of its residential neighborhood along the edge the city park, while preserving all of the mature Mohagany and Bischovia trees on the project site. The AIA logo is a trademark of the American Institute of Architects and is used with permission. All designs, photographs, and drawings are property of Victor J. Latavish AIA, AAC001831, Naples, Florida.